Explore a spellbinding match-three paradise! Journey to the ancient land of Babylon as you explore a spellbinding match-three paradise in Babylonia! Match alluring flowers to eradicate tiles, collect the gold coins and other resources to restore the legendary Hanging Gardens to their former majestic glory! 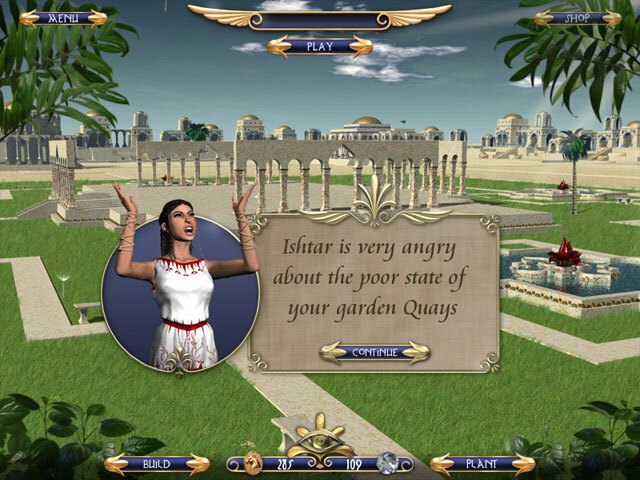 The goddess Ishtar hasn't made it easy for you; there are 150 levels of challenging game boards that will test even the most experienced player. Fortunately, you can collect mana to enable exciting power ups and use these abilities to aid you in your quest. But that's not all - prepare to experience the wonders of Babylonia! Against the backdrop of a soothing musical soundtrack, you'll use your accumulated resources between levels to plant and nurture a bountiful harvest of blossoms. Learn about the history and significance of many flowers, and use this knowledge to recreate one of the ancient Seven Wonders of the World!